Craving some adventure? We’ve got you covered. Located in one of the most biodiverse places on the planet, the Osa Peninsula is one of the most amazing places to explore. Literally, around every corner is a place filled with the artistry of nature. Look up! The Osa is the only place in Costa Rica where you’ll find four species of monkeys—squirrel, spider, white-face capuccin and howler monkey. Look out into the ocean, and you will find dolphins frolicking and humpbacks breaching. Look into the jungle, and you never know what you will see. Our eco adventure tours will open your eyes to a new world of wonder and awe. We offer everything from bird watching, kayaking through the mangroves, to waterfall rappelling. Our eco-tours are perfect for active people who are searching for a unique experience within nature while respecting and protecting the environment. Transportation to tours is NOT included in the prices below. Please scroll to the bottom to see what they are. Please see the shuttle prices at the end of this document. 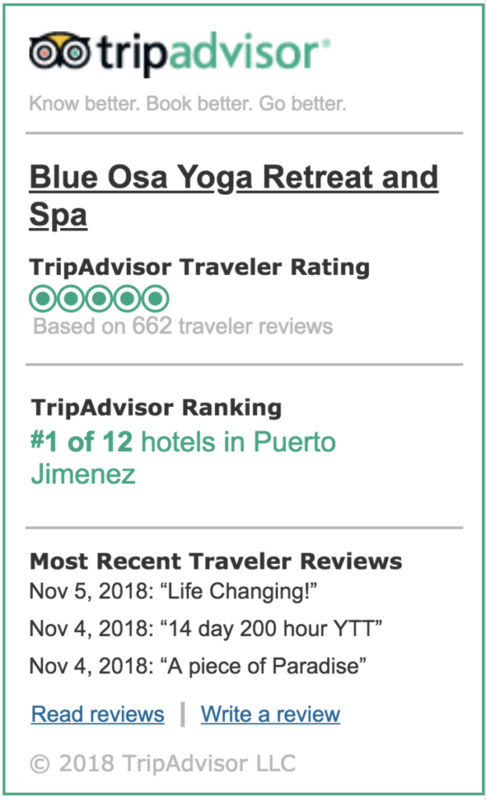 Please wait to book your tours upon arrival at Blue Osa. There is NO need to book your tour prior to your arrival. All prices below are subject to change without notice and may not reflect the current rates. Most of our tours are available year-round. Should you need to cancel your tour, please provide 24 hours notice to avoid incurring the full tour cost or voiding Gift Certificates. If cancelled with less than 24 hours notice, we charge 50% of the tour cost. Bring appropriate footwear. For most tours, tevas are fine. Please bring running shoes for the waterfall, tree climbing, horseback riding, and zip-lining tour. Please bring your beach towel with you and leave it in the vehicle during your tour. if you are wet upon returning, please sit on the towel. Remember to put on sunscreen and bring some with you. Always bring your camera. If your tour involves water, dry bags are available there. If you would like to tip the tour guides, please bring some cash with you. Please remember we do not have small bills at the office to make change. This is the perfect guided eco-tour in Costa Rica for those who may not have the time to visit the Corcovado National Park itself. Cape Matapalo is one of the most breathtaking locations on the peninsula and is filled with wildlife. You are certain to see most of the species of local monkeys, scarlet macaws, coatimundis. Keep your eyes pealed for toucans, agoutis, and jaguarundis. The forest, that you will be hiking in, is contiguous with Corcovado Park and has many of the same plants and animals that you would observe there. One of the most exciting parts of this tour is that it ends at a waterfall. This is the perfect eco-tour for those who do not want to leave Blue Osa but would like to explore the natural, beautiful environment surrounding us in this amazing Rainforest Jungle Adventure Hike. Leave with a packed snack and enjoy our in-house naturalist guide as he shows you the jungle secrets that surround us. Towards the end of the trip, the guide will usually find and cut open a coconut for you to enjoy. The essence of enjoying an adrenaline-packed Costa Rican vacation is our zip-line and canopy tour. This is among the most thrilling local activities and at the same time the safest. Glide through the canopy up to 30 meters in the air, eye-level with the forest wildlife. Enjoy the thrill of the ride. Low impact and easy to control your speed. 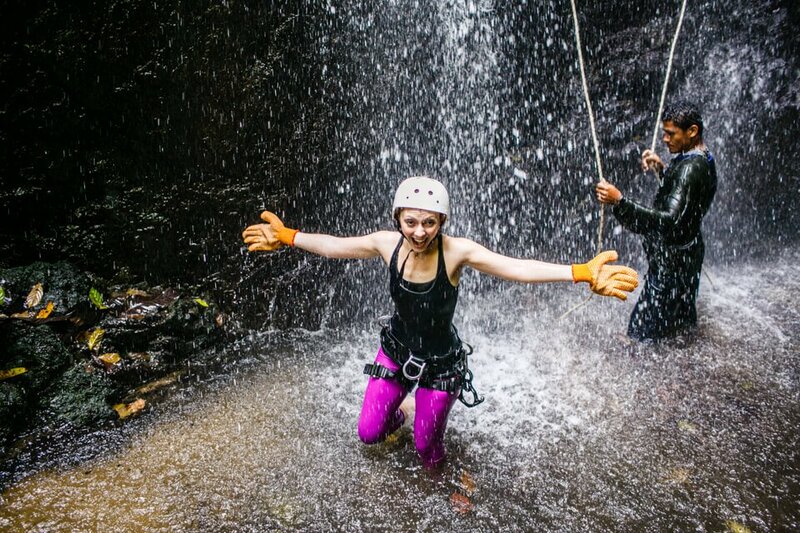 Let the magic of the Costa Rican rain forest seep into your consciousness while you travel on one zip-line to another. This Costa Rica eco-tour will take you back to the roots of cacao agriculture during the Mayan times and help teach you about how chocolate is produced. First enjoy the cacao orchards, learning about the various kinds of cacao and how it fits into the natural food cycle. Follow that by sampling the cacao fruit, remembering that chocolate comes from the plant’s seeds. Next follow the preparation process, including fermentation, drying, roasting, and finally the making of raw chocolate. Last but not least, enjoy the result: delicious chocolate fondue, served with fresh, local fruit and banana bread, all organic and homemade. Leaning never tasted so good! Explore the mangroves and have the opportunity to see all kinds of wildlife, up close and from the vantage point of a kayak. With their incredible root system that grows above water and spreads out as if by walking, the mangrove is a fascinating area to explore. Find yourself in the shade of 80-foot mangrove trees that are host to an amazing array of bio-diversity. The mangrove is a vitally important part of the ecosystem because it acts as a filter for reefs, as well as being a bridge where the land meets the ocean, making it home for crabs, birds, lizards and all types of animals and insects. Dry bags are supplied for your cameras. The paddling is fairly easy and relaxed because your guide will take you up-river with the tide and then turn around to paddle back down again with the tide. However, please know your own limits before signing up for this tour. 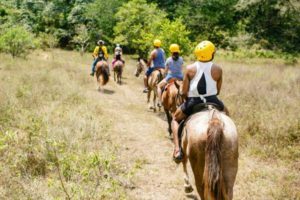 Riding horseback through lush lowland meadows, dense tropical rainforest and across pristine beaches is a truly magical way to immerse yourself into the breathtaking wilderness of the Osa Peninsula. 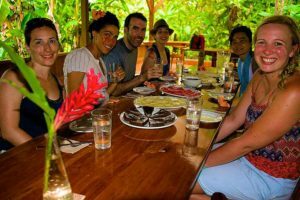 Experienced English speaking guides will take you on an unforgettable ride of a lifetime, including stopping at a stunning viewpoint with an incredible vista overlooking Golfo Dulce and the surrounding Osa Peninsula. Along the way the guides will point out hidden treasures like exotic animals and plants, providing an opportunity to learn about this unique environment. The horses are tame and well cared for, and no previous experience is needed with riders of all ages and levels catered for. This horse riding tour can be done on its own, or in combination with waterfall rappelling and / or tree climbing. With 359 species of birds that call the Osa Peninsula home, the entire peninsula is rich birding ground. And not only are there a wide variety of habitats and healthy populations for birds but other wildlife too. With this eco-tour, enjoy the best opportunity for birding at Playa Tamales. Blue Osa does not book reservations for either in-shore or off-shore fishing. We also will not make ANY bookings for you while you stay with us. Please make your own bookings. These are two operators we know of, but we encourage you to do your own research. The Osa Wildlife Sanctuary is dedicated to the care of orphaned and injured wild animals for subsequent re-introduction to their original habitat. The Sanctuary is located on the northeast corner of the Golfo Dulce and cannot be reached by any means other than boat. The facility receives mostly juvenile animals that are orphaned by illegal hunting or that have been for some reason abandoned by their mothers. Many of these tiny vulnerable creatures are friendly and can be petted, making this destination one of the most family-friendly activities in the whole region. The tour begins with a boat ride across the Golfo Dulce to reach the sanctuary. After the tour there and on the return trip to the dock in Pureto Jimenez, depending on the time of year you will have the opportunity for dolphin watching, and snorkeling. Pan Dulce Beach in Matapalo is one of those rare places where there is a long ride which is great for all skill levels. It is also an ideal place for learners where the surf is gentle making it easy to learn but big enough allowing you to stand and ride. Tours vary according to the tide schedule and must be reserved in advance to ensure availability. This activity is great for all ages. We’ve seen people from sixty-years old to eighty-years young enjoy this activity! Surf board is included in the price of the lesson. This is an exhilarating and fun tour that will have you scaling the largest original jungle gym in the forest! You will be taken to a stunning strangler fig tree that is over 200 feet tall, where your guide will explain how to safely climb up the inside of the tree. Adventurous climbers can reach an altitude of 110 feet inside this tropical tree, a very unique experience. The tree provides strong and natural handholds for safe climbing until you reach a small wooden platform with a truly breathtaking view! As you climb you will be totally immersed in nature smelling the rich rainforest, hearing howler monkeys and seeing scarlet macaws flying overhead. You will then rappel safely to the ground by hanging free from the rope and being guided down by the experienced guides. This tour can be done on its own, or in combination with horse riding and / or waterfall rappelling. Price: $99. Tree climbing and waterfall combo is $145. This wild and wet adventure will get your adrenaline pumping! 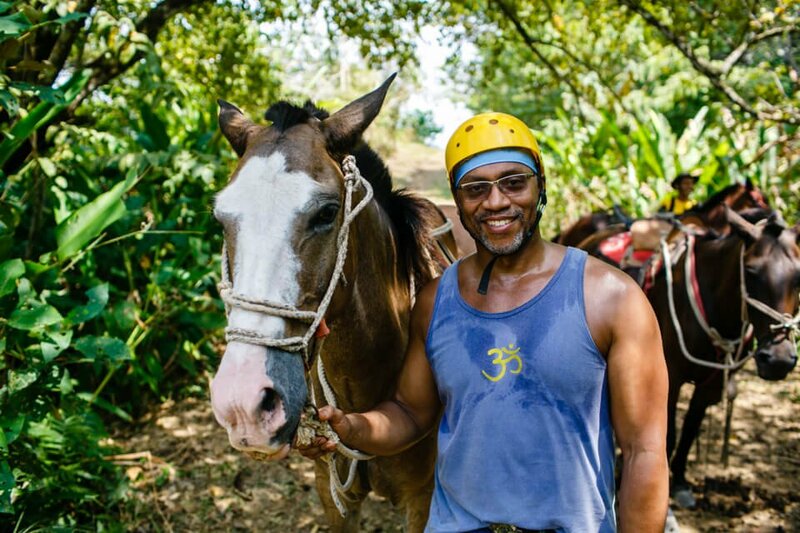 You will make your way to the top of the mountain on horseback and then enjoy a 10 minute beautiful jungle hike as your guide points out exotic wildlife along the way. It is not unusual to see monkeys, macaws, toucans, green and black dart frogs and various lizards! You will reach the crest of the King Louis waterfall, a stunning cascade of water flowing down into a pristine pool at the bottom. The guides will brief you on the rappelling equipment and get you into your harnesses, followed by an explanation of how to rappel safely. Then it’s time to have the experience of a lifetime and descend the 100 foot waterfall! Don’t forget to pause for a moment while you’re up there to (literally) soak it all in! This tour can be done on its own, or in combination with the tree climbing. After 130 million years of existence, the future of these magnificent creatures depends on us. There are seven species of sea turtles in the world and all of them are considered threatened or endangered due to poaching, predation, habitat disturbance and degradation and in-water threats. The southern beaches of the Osa Peninsula are visited primarily by two species of nesting turtles: Olive Ridley and Black or Pacific Green turtles. Blue Osa has joined forces with the Osa Conservation who works to protect these magnificent creatures on two critical nesting sites in the peninsula – the Piro and Pejeperro beaches. Read more about how Blue Osa is helping to save the sea turtles. 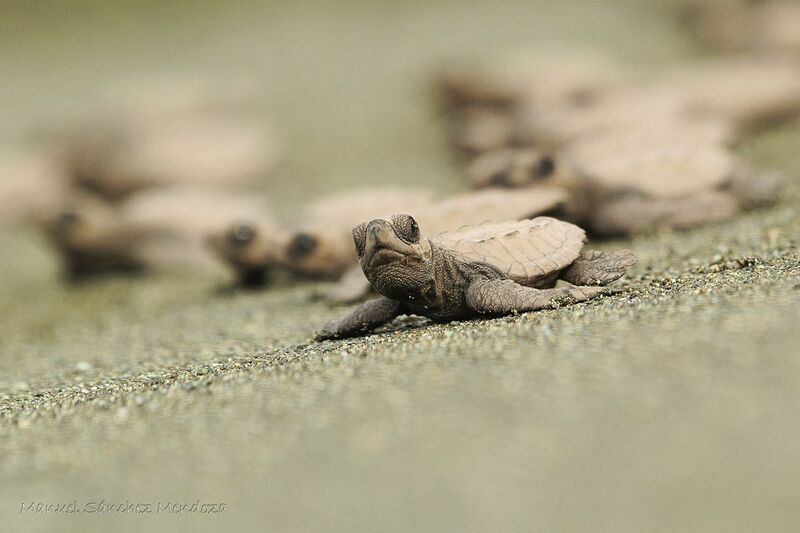 The Osa Conservation sea turtle conservation program monitors the nesting activity, predation rates and hatchling success of these incredible species. Performed in the early hours of the morning, from 5:30 to 7:00 am in order to avoid high temperatures and activity of predators. We will pass through the station on a path that will take us between 10 to 15 minutes to the nursery. We encourage all participants to have boots for the condition of the trail and crossing the Rio Piro. Once we’re in the nursery receive introducing our project and goals of our nursery, dynamic activity and proceed to the release of turtles along the beach, all the babies we’ll be releasing in the areas where they were collected and spawned by the mother. Babies will be releasing in the upper part of the beach, which help them perform imprinting – a process of recognition of the beach which will help them to return when they are adults. We will depart at 5:00 am to their beach. Once there you will be recording the tracks that were not recorded the night before. You will also be relocating nests that are in the danger zones which are too close to rivers or high tides and bring the eggs to the hatchery. You will lastly mark the nests by means of the method of triangulation to allow for the release of hatchlings from our hatchery nests. You will leave at 7:30 p.m. out of the Biological Station Piro. All patrols will be given an orientation of the activity before departure. Monitoring patrols will be carried out on the Piro beach. As the turtles come out of the ocean to lay their eggs, we will be marking them, taking measurements of the carapace length, species identification by counting scales and scute. We will also perform a health assessment. You will be awestruck as you watch nature in action. 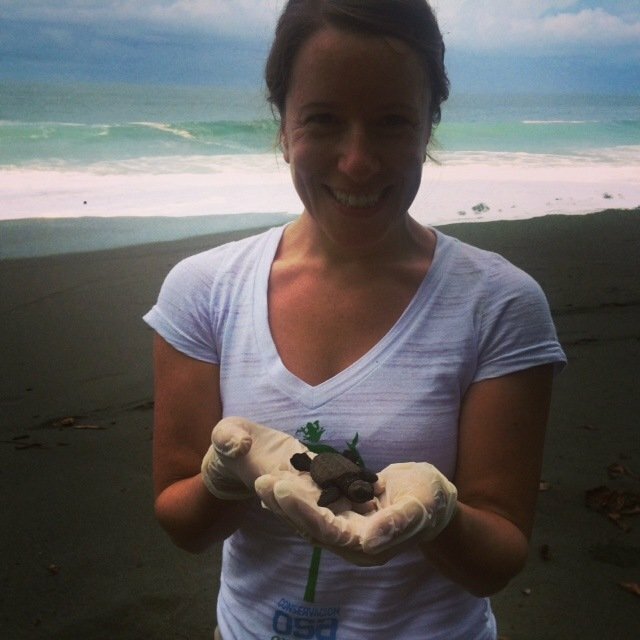 Find Out How Blue Osa Is Saving The Sea Turtles! Blue Osa does not arrange this tour for guests. 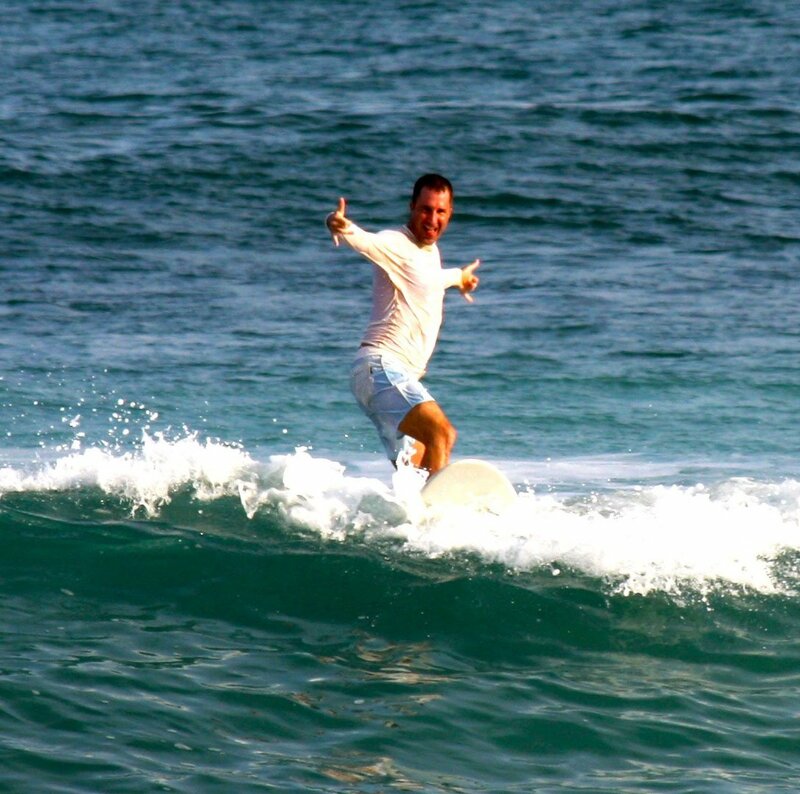 You may contact the guides directly who lead this tour and arrange it yourself. You can reach Carlos and the association of guides here. [email protected] The phone number for Carlos is (+506) 8373 4807. 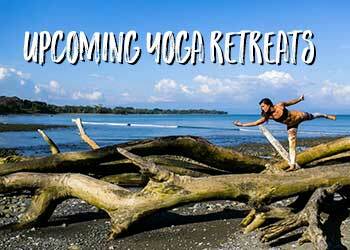 One of the best ways to experience Costa Rica is at the Corcovado. Corcovado National Park is the crown jewel of the world-renowned Costa Rican National Park system. 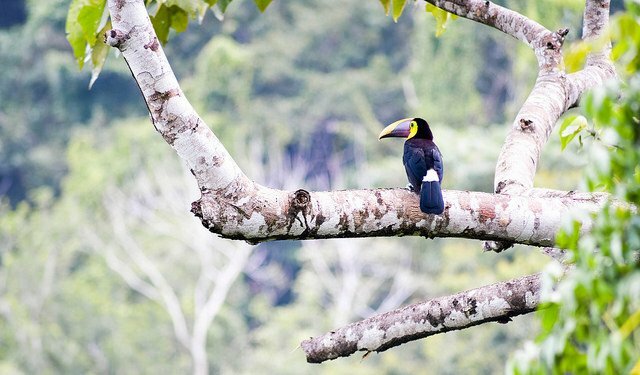 The best way to see the Corcovado is to spend a 2-3 day expedition inside the park. We recommend that our guests go to the Corcovado for no less than 2 nights to enjoy the experience fully. A first rate bilingual naturalist guide will ensure that you are able to optimize your experience. Expect to possibly see tapirs, monkeys, peccaries, coatis, macaws, crocodiles, and sea turtles in season. Pricing for this normally reserved excursion is dependent upon the availability of lodging and meals at Sirena as well as the availability and rates of each independent qualified guide. – If adventure is what you are looking for, this trip is well worth it. – You need properly broken-in–not new– walking/hiking shoes. – This is NOT an easy hike. A lot of the hike is on the beach and it is hot. – The route into the Park is the same as it is on the way out. – You need to bring one single bed sheet with you. – The lodgings are very rustic. – You need to bring a bottle of water with you that is at least 2 liters. Prices for shuttles are NOT included in the tour price.